Sitting, reminiscing on the porch with an old friend is something you have to do sometimes. Last weekend, I had a college buddy of mine stop by before she heads off down South. She’s moving, which makes me super sad, but I know she’s going to love it. We spent a good portion of Sunday morning sitting in the rocking chairs on my porch, just enjoying the spring sun and chatting about how much fun we had when we both lived abroad in France together. We hit on topics like tram rides before French class, walking across Grenoble, lost bags of chocolate left on trains, and how I unintentionally helped her end her vegetarian streak. There was bacon involved in the last one, because, like I’ve said before, no one can truly ever say no to bacon. Let’s just say that I may have suggested she try some bacon at breakfast one tried Sunday college morning, and the rest is history. I feel slightly sorry for that, hence me almost always trying to make a vegetarian meal when she visits. 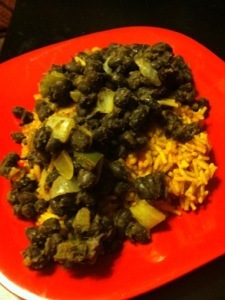 That’s how this rice and beans dish came about. Don’t tell her I do this, she would probably rather I cook something with meat, to be fair. Cook rice and set aside, covered to keep warm. In a separate pan heat olive oil on medium-high heat. Add onions and pepper. Saute for about 8 minutes, or until onion is starting to brown and caramelize. Add drained black beans and seasonings. Cook for another 5 minutes, or until beans are heated through. They may start to fall apart, that’s OK. The beans will still taste as good. Serve beans over rice and enjoy.